South Korea’s presidential committee aimed at coordinating national strategies to boost the country’s competitiveness in the “fourth industrial revolution” will focus on next-generation health care and smart city development next year, its chief said Monday. In health care, the Presidential Committee on the Fourth Industrial Revolution will push for specific agenda items including the operation of a pilot health care big data collection and management platform, AI-backed new drug development platforms and the development of a smart clinical trial management platform. It will also propose a pan-ministry project to develop next-generation medical devices utilizing AI, big data analytics, 3D printing and robotics technology, while mediating social discussions on contentious issues like gene therapy regulations and medical data protection laws, it said. The committee will make a general policy proposition to the government early next year as well, detailing regulatory steps to better foster each technology area and inviting action from the relevant ministries. For better communication between the government, the private sector, lawmakers and citizens, the committee said it will continue operating a special private-public task force for autonomous vehicles and smart factories, while creating a new task force dedicated to blockchain technology and initial coin offerings. Despite its stated goals, the committee has drawn flak this year for failing to deliver tangible outcomes in mediating conflicts or supporting new business models, with one representative example being the latest controversy over carpool service apps. In recent months, with the widened deployment of carpool services -- ride-hailing platform services that operate within legal limits defined by the local transport law -- startups and big technology companies like Kakao have clashed with the taxi driver union. Last week, Kakao pushed through with its carpool business by launching a pilot version of its carpool service. Despite continued protest from taxi drivers, the firm plans to formally roll out the service on Dec. 17, a move widely considered an independent breakthrough by the firm. “Looking back, I think the committee did good in bringing the carpool issue to public attention and igniting a debate. However, we admit that the committee fell short of mediating a consensus on the carpool issue and in turn limiting citizen’s rights to convenience (and alternative ride options),” Chang said during a press conference in Seoul. “During its second term, the committee will work to ensure that lawmakers are included from the beginning stages in forging solutions to contentious new technology business problems,” Chang said, adding that the carpool issue proved that involvement from not only government ministries but also the National Assembly is needed to arrive at comprehensive solutions. On top of playing the role of mediator, the committee also pledged to promote and raise awareness of new technologies and business models among the public. “In the end, the final player that gives weight to any proposed regulation (regarding a new technology or service) is the people. Lawmakers are bound to pay attention to ‘public sentiment’ which inevitably drives any policy direction,” Chang said. “In this respect, public awareness is an important aspect that must be addressed. Once a general direction is set, specific government regulations can be maneuvered by relevant ministries,” he said. 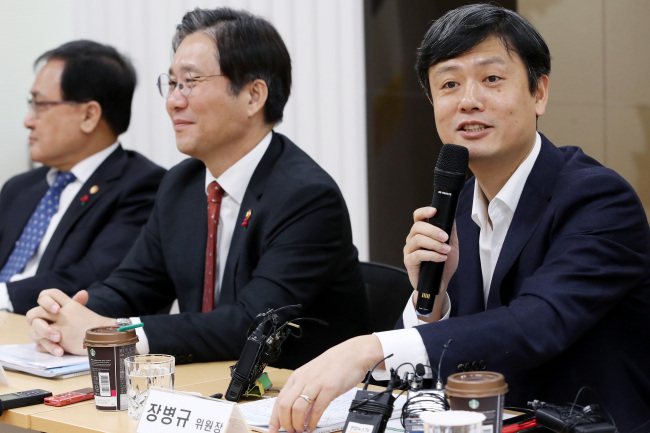 The presidential committee convened for the first time since beginning its second term with a new group of members and advisers under Chang, who is also the chairman of Korean game company Bluehole. Citing the economic impact of “smart intelligence” driven chiefly by AI and big data analytics, the committee said the government must assist Korea’s major industries in adopting speedy changes in this direction via public-private partnerships and regulatory support. The body predicts the improvements brought to diverse industries will result in up to 630 trillion won ($559.2 billion) in economic gains, of which 240 trillion won will come from new businesses pursuing smart technology adoption. Of this 240 trillion won, the committee said health care will account for 150 trillion won, manufacturing 150 trillion won, city development 105 trillion won and finance 80 trillion won, it said. These are the main focus areas for Korea’s “smart intelligence” push, it said.